This past Saturday, 13 volunteers came out to Simon Elementary School to help give trees some much-needed tender, love and pruning. The volunteers joined five Casey Trees staff members to tend to about 60 trees on the school's grounds and surrounding parks. Among the group were 11 Citizen Foresters and six returning volunteers from the last pruning event at Murch Elementary. There was a wide range of tree species on site, including cherry, elm, zelkova, pin oak, red maple, crepe myrtle, and river birch. Due to the hot, dry conditions and lack of attention, many of the trees had branches that were dead or brown. But the short pruning event went a long way to improve the health of the trees. By 10:45 a.m. our staff and volunteers had taken care of the whole area! 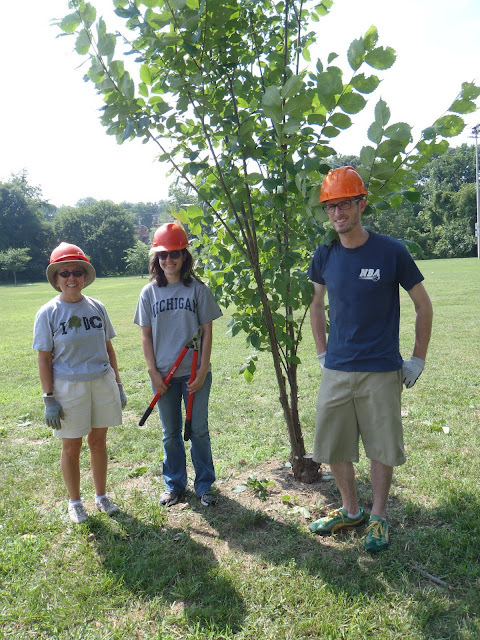 If you're interested in volunteering for our next pruning event on August 20th at Lafayette High School, contact Shawn Walker, our Urban Forestry Instructor, at swalker@caseytrees.org. Citizen Foresters are highly encouraged to sign up - and if you've already attended at least one pruning event this summer, you can still receive a free pair of pruners! Check our calendar for all upcoming events as well.